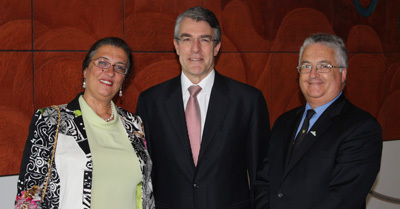 Hungarian Ambassador Anna Siko, Mark Dreyfus and Ron Forrester, son of Holocaust survivor Ervin Forrester. “I rise to honour the memory of Raoul Wallenberg, the Swedish diplomat whose courage, spirit and ingenuity saved the lives of over 100,000 Jews in Budapest during the Second World War. There are many memorials to Wallenberg in Melbourne and Sydney, and trees planted in his memory in front of our Parliament. Wallenberg has been remembered in many different ways – my father George Dreyfus in 1984 composed ‘In Memoriam, Raoul Wallenberg’ a suite for clarinet and piano, as a tribute to him. This year is the centenary of his birth, and his life and work are being celebrated around the world. The Holocaust is a wound that time will not heal nor diminish. Raoul Wallenberg has no grave. Arrested by Russian troops in January 1945, his fate has since remained a mystery. The lives of those he rescued are his greatest memorial – the tens of thousands of Hungarian Jews he saved from the Nazi machine. We are honoured to have survivors he rescued living in Australia today. One such survivor is Ervin Forrester, who arrived in our country in 1950. His son Ron is with us in the gallery today. Ervin’s story is one of incredible personal bravery. As a young Hungarian boy he was forced by the Nazis into the Working Army in 1944. He escaped and fled to Budapest where he was sheltered by the Red Cross. But Budapest was not an easy place in which to hide, and Ervin was recaptured and sentenced to death for his desertion. He told the Nazis he was a Swedish citizen. The authorities contacted the Swedish embassy and Raoul Wallenberg came to him in his prison cell and said “I’m going to save your life”. He issued Ervin with a Swedish passport and protection of the Swedish nation. I would also like to mention another Holocaust survivor he rescued. Professor Frank Vajda was denounced by the Nazi authorities for the simple yet symbolic act of removing the yellow star the Nazis forced him to wear. He was marched to a military barracks and lined up in front of a machine gun. At that critical moment, Raoul Wallenberg arrived, negotiated with the authorities and led him away to safety. Frank became a Professor of Medicine in Australia, and along with Ervin Forrester, has made a large contribution to our society. Today I join with all Australians to honour his memory. Raoul Wallenberg’s final resting place is in our acts of remembrance. My father remembered him with a piece of music, and I with this speech today.